The attractive, top-quality game pieces on the lovingly illustrated game board give the impression of a true mysterious treasure island. Each player contributes valuable clues, which determine where the treasures are located. The excitement mounts as the adventurers strive to be the first to arrive at the treasure sites. The 3-piece game board with its innovative design can be set up with 32 different scenarios, each providing fun and a new challenge. This is a great family game. It is nice and simple to pick up and it is still enjoyable even with a fair amount of luck involved. 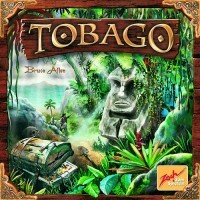 In Tobago the players are treasure hunters on an island. At all times there are 4 different treasures that players are trying to locate on the island. This is done by playing clue cards that eliminate possible locations of a treasure. For example, a card may say that the treasure is on a beach, later somebody could add that it is also next to a river, then somebody could say it isn’t within two spaces of a hut. Eventually the location of the treasure is down to only one possible spot. Then one of the players needs to drive their atv over to the spot and dig it up. Your reward for digging up the treasure and for adding a clue card is a stake in the treasure. The treasure cards range from 2 to 6 coins. In reverse order that you place clues people are offered treasure cards in which they can pass, letting the next person choose, or they can take it. This sounds nice, but of course there needs to be some twists as well. After a few treasures have been dug up the treasure cards have a couple of curses randomly mixed in. When these come up everybody who had a stake in the treasure lose out. Also, you need an amulet (these are spread around the island and can be picked up with your atv) to protect yourself or you lose the best treasure card you’ve received so far. After all the treasure cards have been depleted the game ends and players count up their coins. I think this works great for a family, or some new gamers. For sure this is a great gate-way game. First off, as you can see, I don’t think this is solely a kids’ game. There are many simple elements in Tobago but they layer up so that sometimes the application of logic makes my brain hurt! Wait don’t run off, that’s not a negative; no pain no gain, right? The great thing about Tobago is that kids can play it and have a great time too. The same applies to new gamers. However when played against someone who is good at analytical thinking and plotting moves this game can lead to a world of anguish! Again, don’t let that put you off, it is the sweet kind of frustration, coupled with rueful insight, that means you want to take on the challenge again and again. The modular board is clever, well made and beautifully realised. Plus in the attractive box is a bespoke storage insert which is 100% functional. And the components? Well they are as vibrant and lush as a tropical island itself. The little landrovers (they’re not Jeeps, I’m British) even have windscreens and headlights – nice. Many feel this kind of thing entices children and new gamers hence the idea that this is a ‘light’ game. The rules for each aspect of the game are straightforward, although the language independent icons take a bit of learning. Plus putting it all together and “getting it” wasn’t immediate for me, but it didn’t take long. Now just winning it is my problem. In simple terms when it is your go you either play a clue card or move your vehicle. Clue cards narrow down the locations of one of the four treasures; moving your ‘drover lets you get to them and dig them up. The loot is then share out amongst all who contributed to the location of the treasure with a little bonus to the finder. Then there are the amulets. When a treasure appears so do these magical amulets. these tokens allow you to take extra goes, refresh your hand or dodge curses. Clever use of them is the key to the game, I think. It is as these simple things layer and blend together that the level of thought required increases – ask a chess player. Nevertheless, Tobago is accessible enough that you can happily play without troubling yourself about it’s hidden complexities. Just don’t expect to win if you are playing someone who likes to think three turns ahead. Overall I would heartily recommend giving Tobago a go. There is something there for all who come to the table along with re-playability. What’s more it is served up in a tactile and visual feast. Tobago is a treasure hunting game with a very unique mechanic for revealing each of the four treasures buried on an island. The gameboard is an island consisting of hexes. Players will take turns laying clue cards which constantly reduce the possible location of a treasure on the island to a single hex – then race their game piece to that hex to dig up the treasure. The treasure is then divided among the players who contributed a card to the location of that treasure. Each player receives a treasure card varying from 2 to 6 points for each card contributed. Most treasure wins the game. The components to Tobago are absolutely top notch, from wooden huts, palm trees and and “stone” statues. The first time playing Tobago might cause some head scratching as everyone tries to decipher which of their cards can be played on which treasure to narrow its possibe location, but once that hurdle is cleared the game really shines. There are additional features that add to the game such as cursed treasures and magical amulets which give the players additional abilities on their turn. It all adds up to a great game that I can bring out with just about any of my friends and family. First clue: it’s near the largest lake. Ok, now you put clue tokens around the largest lake. It’s one of those. Second clue: it’s 2 spaces from a palm tree. You identify all palm trees which are 2 spaces from existing cubes, and remove the cubes that don’t match this and the previous token. Third clue: it’s in the forest. Aha! Now there’s only one possible tile where the treasure is. First one to get there gets to start the treasure drawing. And this is the part I don’t like. Everyone who’s contributed to the clues gets their chance at receiving treasure. Every of those players get dealt one card each, showing a treasure value or a skull. Then everyones card is shuffled back, and the treasure finder draws the first card. He knows of one of the treasures, but not the rest. If he knows there’s a skull in that pile, and draws a low value card, he might take it. Or he could pass in the chance of getting a larger value. It’s too much randomness dealing out treasure. And moving around on the board seems futile as the clue tokens change so much. And when you play a clue and help the others, you’re too far away to get it yourself. Being first is important in the drawing phase. But, the thematic sense of the game is good, and the components are awesome. I could play this with a younger audince, but probably turn down a game otherwise. Nice family game, no gamers game. We had a great time with this when it first came out. It’s absolutely beautiful. The problem is the setup time for a family game is a bit long, and the kids forget the rules. It’s not quite strategic enough for adults to play over and over. Thurn and Taxis is better. When i first got the game it looks very nice with great componets and a nice game play. But after the second game we lost oyr interst for the game. Even the kid don’t like it. Except for the componets nothing else is good.The luck factor is very big in this game. Add a Review for "Tobago"